An "aspirational" ad campaign of the late 1960s proclaimed, "You've come a long way, baby." It took event planners a while to catch up. But they assuredly have, as made clear by Kerry Smith and Dan Hanover's 200-page Experiential Marketing: Secrets, Strategies, and Success Stories from the World's Greatest Brands. No longer "corporate wedding planners," experiential marketers in the 2010s have become marketing kingpins—the drivers and integrators of all the marketing "silos." "Live experiences have ignited a marketing revolution in which brands around the world have committed to upgrading their marketing strategies, budgets, and platforms," Smith and Hanover write. "And that revolution has driven a much-needed evolution of the marketing channels and silos used by brands for 50 years." The heart of the book lies in Chapter Four, "Anatomy of an Experiential Marketing Campaign," where the authors describe the 11 "Experiential Pillars" underpinning the channel. 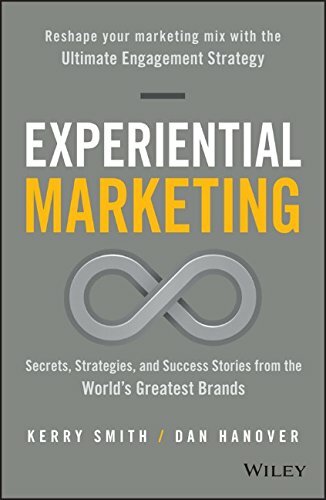 "As with a great recipe in which the ingredients are blended together to create a unique flavor, these pillars work together to optimize engagement and will allow you to achieve the brand-building, value-creating, clutter-braking power of experiential marketing," they write. They base the chapter not on hard knocks or gut feelings, but an analysis of the 1,000+ winners of the Ex Awards, the annual awards competition for live events they've produced since 2002. And the events they consider take not one form, but many, from PR stunts, in-store events and road shows, to trade shows, user conferences and sales meetings. Reading Experiential Marketing tempted me to update my recent post, "My 5 All-Time Favorite Books on Marketing," because the book has the same quality as the "mind-blowing game-changers" I listed there. No matter how much you've dabbled in event production, the authors give you a palpable sense while you're reading the book that you're on a path of discovery; that you're like one of those "Pioneers of Television" who's in at the inception of a powerful new medium with a yet-understood capacity to build large audiences and fundamentally reshape worldviews.